Arthur Edwin Johnson was born in Stokesley in 1896. He was the son of William Johnson who was himself born in Stokesley in 1862 and Annie Harforth who was born in Whitby the same year. William and Annie were married in Stokesley in 1882. William Johnson’s family appears to have arrived in Stokesley around 1820 and were well settled in the town, whereas Annie Harforth’s father was a grocer in Whitby and the Harforth family must have moved to Stokesley some time in the 1860s as her mother, a fishmonger, and family were living there in 1871. William Johnson had a varied working career, at various times he was a tailor, an omnibus driver and a bricklayer’s labourer. When Arthur was born, eighth of ten children in the Johnson family - Florence, William, Ada, Harry, Jenny, Fred, May, Arthur, Elsie, and Sybil – the family were living in Miles Yard off the High Street. In 1911 Arthur was still at school and living with his parents and 6 of his siblings at Brookside, Stokesley, listed as being 13 years old. 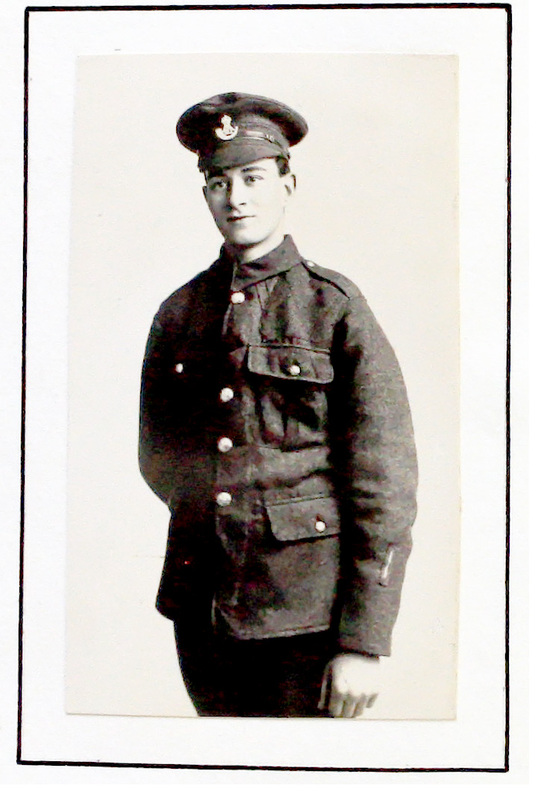 However, when he enlisted in Stokesley in December 19151, Arthur's age was given as 18 years and 10 months. Presumably, either Arthur lied about his age or his father made a mistake on the census form! Military records do confirm that Arthur was still resident in Brookside, Stokesley, and tell us that he had found employment as a farm labourer, his next of kin being recorded as his father, William Johnson of the same address. Unfortunately, although Arthur’s enlistment documentation survives, much of it is now illegible and the only part of his physical description which is clear gives his height as 5’6½’’. Arthur Edwin Johnson enlisted at Stokesley into the 15th Northumberland Fusiliers and in his career of two and a half years he seems to have had five different regimental numbers and two different regiments. While with the Northumberland Fusiliers he was at first No. 29206, then 61139 and still later, 47449. He was transferred to the 20th Durham Light Infantry on 4th October 1916 where he was given first the number 6169 and then later 203966. The 20th Battalion DLI was attached to the 123rd Brigade, 41st Division. The Book of Remembrance tells us that they arrived in France towards the end of the Battle of the Somme 1916, and that they were moved to Italy, North West of Treviso, in November 1917, remaining in Campo San Pierro until February 1918. Italy was Britain’s ally in the Great War, but the Italians did not find it easy to hold off the attacking Austrian armies. This account leaves virtually a year of campaigning unaccounted for (Oct 1916-Nov 1917), a period including heavy fighting on the Somme (Passchendaele) which came to an end at about the time that we are told that Arthur Johnson's unit was moved to Italy According to the Book of Remembrance Arthur was awarded the Military Medal in January, 1918 whilst in Italy. This medal was quite a new award, established on 25th March 1916, and was awarded to non commissioned personnel for “gallantry and devotion to duty”. Official sources date the return of Lance Corporal Johnson's unit to France to January 1918, rather than February, but moving armies about was a cumbersome business, and we have no reason to doubt that it was February when Arthur Johnson himself arrived back in France. Certainly by 9th March 1918 the DLI were based near Doullens and Mondicourt, near Arras. Arthur’s battalion in the 41st Division became part of the 3rd Army which less than a fortnight later found itself engaged in trying to fend off the German offensive known as “Operation Michael”, which triggered the final round of the Battles of the Somme. The Germans had been able to bring reinforcements from the East following the collapse of Russia, and they were keen to make progress before the anticipated arrival of American troops. The German aim was to strike the British Expeditionary Force (BEF) along the Somme and cut it off from the French to the south. Leading the German attacks were special stormtrooper units whose orders called for them to drive deep into British positions, bypassing strong points, with the goal of disrupting communications and reinforcements. At 4:35 AM on March 21, German guns opened fire along a 40-mile front. It was the largest bombardment ever seen on the western front. Facing the German onslaught were General Julian Byng’s 3rd Army in the north and General Hubert Gough’s 5th Army in the south. In both areas, the British suffered from possessing incomplete trench lines as a result of an advance after the German withdrawal to the Hindenburg Line the previous year. German troops achieved great successes across the front with the largest advances coming at St. Quentin and in the south. At the northern edge of the battle, Byng's men (including the Durham Light Infantry) fought tenaciously to defend the Flesquieres salient which had been won in the bloody Battle of Cambrai. To the south, Gough's men were driven from their defensive zones along the front during the opening days of the battle. As the 5th Army fell back, the commander of the BEF, Field Marshal Douglas Haig, became concerned that a gap could open between Byng and Gough's armies. To prevent this, Haig ordered Byng to keep his men in contact with 5th Army even if it meant falling back farther than ordinarily necessary. On March 23rd, believing that a major breakthrough was in the offing, Ludendorff directed 17th Army to turn northwest and attack towards Arras with the goal of rolling up the British line. The whole of the Third Army had swung back, pivoting on its left, so that, although the VI and XVII Corps were little behind their positions of the 21st March, the right of V Corps had retired seventeen miles. The new line, consisting partly of old trenches and partly shallow ones dug by the men themselves, started at Curlu on the Somme and ran past places well known in the battle of the Somme, the Bazentins and High Wood, and then extended due north to Arras. It was, for the most part, continuous, but broken and irregular in the centre where some parts were in advance of others; and there were actually many gaps…Further, the men of the right and centre corps…were almost exhausted owing to hunger and prolonged lack of sleep." Late that night Haig, after first dining with General Byng urged the Third Army to 'hold on … at all costs'. (Douglas Haig: War Diaries and Letters 1914 – 1918 Sheffield and Bourne 2005). It was against this backdrop of crisis that Lance Corporal Johnson was reported missing believed killed on 24th March 1918 in the Battle of St Quentin. Because of the rapid German advances the majority of the soldiers who died at this time have no known grave. Lance Corporal Johnson was one of 4 brothers who enlisted, 2 of whom died. He was 21 years old when he fell. He was awarded the British Medal and Victory Medal as well as the Military Medal he had won just a few weeks before he fell. He has no known grave, but is commemorated on Bay 8 of the Arras Memorial, Pas de Calais. He is also commemorated on the Middlesbrough War Memorial. Go to next soldier: Johnson G.